Known for his double-bladed red lightsaber and his creepy horned head, Darth Maul wreaked havoc throughout a galaxy far, far away. 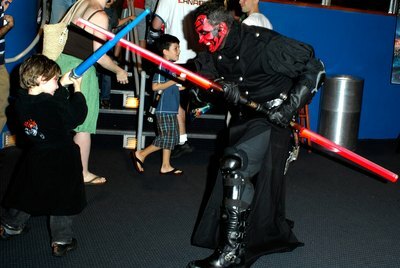 Appearing in the first installment of the “Star Wars” series, “The Phantom Menace,” Darth Maul was an evil Sith Lord that was eventually defeated by a young Obi-Wan Kenobi. This well-loved foe is often a choice for costume parties or Halloween costumes due to his dynamic black and red makeup and his 10 interesting horns. Plan for a long makeup application, but rewarding results, as you haunt your event as this menacing warrior and mastermind. Place a bald cap on a Styrofoam wig head. Glue the demon horns onto the bald cap with spirit gum. Paint the spirit gum onto the horn and place it onto the cap. Hold into place until the gum dries. Position two horns at the temples, one on the top of the head and seven in a ring around the head. The horns are approximately 2 inches tall. You may have to cut your horns down before gluing them in place. Place the bald cap on your head. Secure the cap to your head by brushing spirit gum along the edge of the cap and adhering it to your forehead and around your hairline. Let dry. Sponge black makeup on the back of your neck. Work your way up onto the bald cap. Sponge black makeup on the back portion of your head, stopping in front of your ears. Apply red makeup on the remainder of your head and down the front of your neck. Take black liquid eyeliner and draw the outline of Darth Maul’s markings on your face and head. Use a photo of the character as a guide. Fill in the outline with black makeup. Wear a long-sleeve black T-shirt as a base for your costume. Put on both pieces of the karate gi. Take the weight belt and place it unbuckled on the work surface. Measure across the front of your waist. Write the number down. Measure from your waist to just below your knee. Cut a piece of black fabric that measures the width of your waist and the length to below your knees. Glue the piece of cloth to the inside of the weight belt. You will glue it to the section that is opposite of the buckle. Let dry. Wrap the sides of the gi across your chest. Buckle the belt around your waist to secure it. The buckle will fasten in the back and the cloth will cover the front of your legs. Slide a rubber band over your forearm and the cuff of the gi top. Push the rubber band up so the sleeve starts to blouse. Do this for both sleeves. Use the same technique with the pant legs of the gi. Put on the black rubber gloves. Position the cuffs of the gi sleeves so that the top of the glove covers the ends and rubber bands. Put on the boots. Stick the ends of the pants inside the top of the boots.